Polaris presents a heavy duty version of its best-selling automatic ATV, the Sportsman 500 H.O. 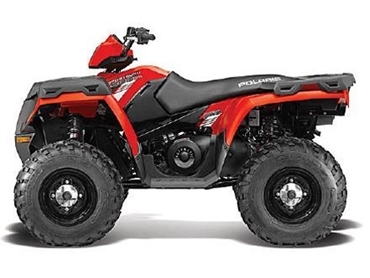 One of the pillars of the Polaris range, the Sportsman 500 is well known for its legendary reliability, ride quality and capabilities combined with excellent value to deliver one of the world’s leading automatic 4x4 ATVs. Polaris’ Sportsman H.O. will now become H.D. with a Heavy Duty specification of the Sportsman 500 just released to the Australian market. Designed specifically to operate in tough Australian conditions, the new Sportsman 500 H.D. features a number of product improvements to enhance performance in this environment. The product improvements follow a visit by Polaris Industries USA management and engineers to Australia and New Zealand in 2012 when they spent countless hours with dealers and end users researching the usage of ATVs in Australian conditions. New features in the Sportsman 500 H.D. automatic ATVs include greasable/sealed ball joints, sealed driveshaft splines and sealed suspension bushings, which not only provide increased durability in the harsh Australian conditions, but also enable easier ongoing maintenance. According to Polaris Industries Australia & New Zealand Country Manager, Brad Wolstenholme, the visit by senior Polaris managers and engineers shows their commitment to not only understanding the Australian market, but also to delivering products that are specifically designed for the region’s unique conditions, climate and usage. All the features of the traditional Sportsman 500 model have been retained including the 498cc high output, liquid cooled engine, On Demand True All Wheel Drive, 28.6cm ground clearance, combined front/rear rack capacity of over 120kg and towing capacity of 555kg. The radiator is also mounted 3” higher in the chassis and angled rearward to provide greater protection from mud and debris. Polaris is a recognised leader in the powersports industry with annual sales exceeding $3 billion. Polaris designs, engineers, manufactures and markets innovative, high quality off-road vehicles (ORVs) including all-terrain vehicles (ATVs) and the Polaris RANGER side-by-side vehicles as well as snowmobiles, motorcycles and on-road electric/hybrid powered vehicles.